[Left to Right] Peter Picknelly - Peter Pan Bus chairman/CEO with one and two million mile safe drivers drivers: Thomas Crepeau; Luis Fernandes; Jose Lisboa; William Chandler; Ricky Johnson; VP, safety & security, Chris Crean; and driver Roland Rich. Springfield, Mass.-based Peter Pan Bus Lines honored one and two million mile safe drivers at its annual “Super Team Achievement & Recognition” (S.T.A.R.) Awards dinner in late March. S.T.A.R. represents and salutes those employees who best exemplify the highest standards in safety, customer service and dedication to Peter Pan’s core values. 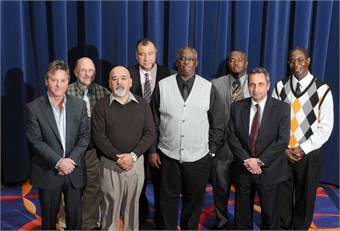 The following drivers were honored for achieving One Million Mile Safe driving status: Springfield, Mass. drivers Ricky Johnson and Jose Lisboa; Providence, R.I.-based Thomas Crepeau; and Secaucus, N.J.’s Roland Rich. In addition, six drivers were acknowledged for Two Million Mile Safe Driving status: Providence, R.I.’s Samuel Cabrera, William Chandler, Luis Fernandes and William Johnson; Springfield, Mass.-based Don Fonner; and Boston’s Frank Lapomardo. Peter Pan coaches travel more than 14 million miles in a year — the equivalent of nearly 59 trips to the moon or 562 times around the earth. The company has consistently achieved high safety ratings and is proud to have more million mile safe drivers than any other bus company its size, according to Peter Pan. More than 200 employees and associates from the intercity bus industry gathered for the annual awards ceremony from points throughout the Northeast.